“Fungi, an underestimated ressource” this is what announces in magazine of the IRD, which stands for the French Institute for Research for Developping Countries. We are not the only ones to have revealed the Pandora Box : Robin Duponnois of the IRD, woks in Mali since 2006 on termite dust. He discovered that it was a perfect fertilzer for vegetable. What is it in fact? Termites live in symbiosis with mushroom which they grow. These mushroom digest all the plant residu they are bringing back home. With this the mushroom produces sugar, a sort of honey they feed their larvaes with. In fact it is the mycelium which works, the body of the mushroom; because the mushroom itself, is more like a fruit which bears the spores, waiting for the next breeze with its hat on. The mushroom frees its spores which inoculate the ultra rich humus. So when we spread the dust of termite mounds on a crop, we are spreading mushroom spores which will soon turn into mycelium associated with bacterias. This gang is getting organised together with the roots from the plants, to supply for all the water and minerals they need. The deal is carbon against fertilizer, water and antibiotics. It is just like installing the most sophisticated micro irrigation together with the most updated device to feed with oligo elements and minerals, specialy adapted to each kind of plant. What do you say about this? The extreme interest about mycelium is that it can grow very fast. It runs like Paul Stamets says. And when it doesn’t run fast enough, it “communicates” with its’ social network to organise all the ressources. It uses its Facebook and Twitter. In terms of celebrities, you have only bacterias. But this is what you need here; they bring water in exchange of delicatly prepared carbon. Nothing sad in the “Malheur National Forest” East Oregon, just the biggest and oldest living being on earth : an Armillaria Ssp., a honey mushroom. 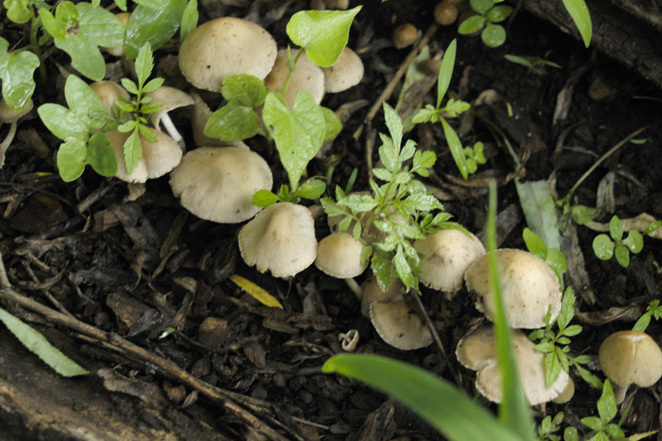 In fact, many forest glades are runned by fungi. They sustain the balance needed by a natural forest. The Armillaria is a tree killer, as well as a forest regenarator for its biodiversity and its force. As long as the tree is vigourous, it will feed it; but at the slight faint, it has no pity; it will eradicate it to prepare the ground for new ones. It looks hysterical, I must say. Nothing to do with the old wise man in the woods. But in order to control it, nature has many devices, like yeasts and other fungis : the cauliflower mushroom, Sparasis crispa, for example. This is for the wine makers and the potato growers: they can control blight by using the same principles. To be sustainable in nature, it is a question of dynamic balance. In fact many mushroom act as prebiotics, favoring good bacteria against bad. But what is good or bad? Man just does not want to think and kills everything with pesticide. Hence, these deals are the basics of life : a plant brings carbon with its falling leaves and its roots. It is in the interest of the mushroom to accelerate the process and make it grow the faster and the bigger. Logic, isnt’ it? It acts like an insurance against climate change. If suddenly tthere is no water anymore, it will bring water from deeper and farther. Or it will switch on its’ Twitter and Facebook for its’ associated bacteria network. They are all addicted to sweets. To pay for it they have organised a super growing control device to supply water, and in case it rains too much, stock it in the aquifer for later. This network, bacteria-mycelium has been organised for more than 600 millions years. Plants joined in 400 million years ago. It is time that man “becomes a fan”, dont you think so? 80% of living beings live in the 15cm of the top soil. One must always remember that the soil is alive. If it dies water cannot penetrate, it will erode the surface and cast the goodies away. The bacteria and all the living beings allow water to penetrate in the earth. The aerobic bacteria are living on oxygen at the surface together with the anaerobic bacterias deep under. It is the basic of Soil life. So when you till the ground, you just burn the anaerobic with oxygen and suffocate the rest deep under. Henceforth you break up and destroy all the mycelium net. Did you understand? There is no scientific base in tilling: to think it is good for agriculture is cheer credence, nothing else. Evil. Dont think so fast… people make money with water, why not with fungi or air? In its great dedication to save the developping countries the IRD has patented a living being. It is not the first to do so. Still it has patented life: the result of termites and fungi inoculation. Cordyceps myrmecophilia for example, develops itself on wood eating ants. It is used to kill invading termites in the US (not in Europe of course, where we use always more pesticides). Just imagine: It is absoutly facinating to watch this mycelium taking hold of the body of the ant without affecting its vital functions. You see the white mycelium clearly progressing in the transparent body of the ant… until it decides to reproduce itself. It goes right to the brain of the animal and takes control of it. It orders the ant to reach the top of the highest plant nearby and stiffs it right there. Then the mushroom grows on the head of the ant with its’ cap on top to cast its spores away and reach the next bunch of ants. It is a natural pesticide which reproduces itself on its own. Dont tell… very bad for commerce. They learned that a potato plant can give three times more potato, something we’ve been saying to the small producers in the Andes for the project Tikka Papa, for which we got the FAO (UN Food and Agriculture Organisation) gold medal in 2006… a plant like a vine could grow faster and stronger, producing top quality wine, like we teach in Bas Armagnac since 2009. But the worm is now in the fruit. Farmers from the North, if they say this discovery is only only valid for the South, just wake up and ask yourself. The answer is at hand. To be a farmer today is to play at the crossroad of many sciences, botanics, entomology, mycology, cellular microbiology, genetics… But before all, we are in a world of information : agriculture today has also to do with informing and communicating with your soil.